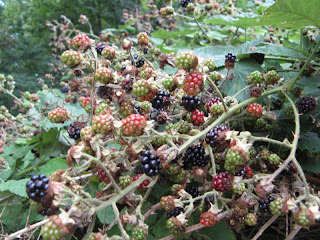 It's early, they say, but the blackberries are ripening. And with it comes the seasonal need for berry and apple crumble. We went for a walk and found them in a quiet footpath, quite close to the house. Someone's hedge that was spilling over a wall. Prickly, but the berries were dark, plump and fresh. We picked until our finger were red. A bag of apples and some baking later, we had crumble. 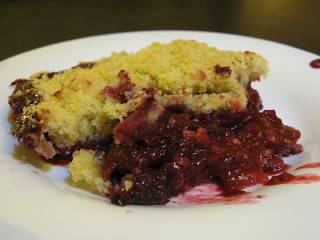 A messy, very berry crumble, with apple hovering quietly in the background. And with amazing intensity in both colour and flavour. Very, very yummy. Makes me think of Peter Rabbit.